I am passionate about packing healthy, well balanced lunches for my kids. But there are those mornings when I wish there was a quick solution to lunch packing that was healthy and delicious. Because we all wake up with a head cold sometimes have bad mornings sometimes and having a healthy lunch solution at hand can be a huge time saver! 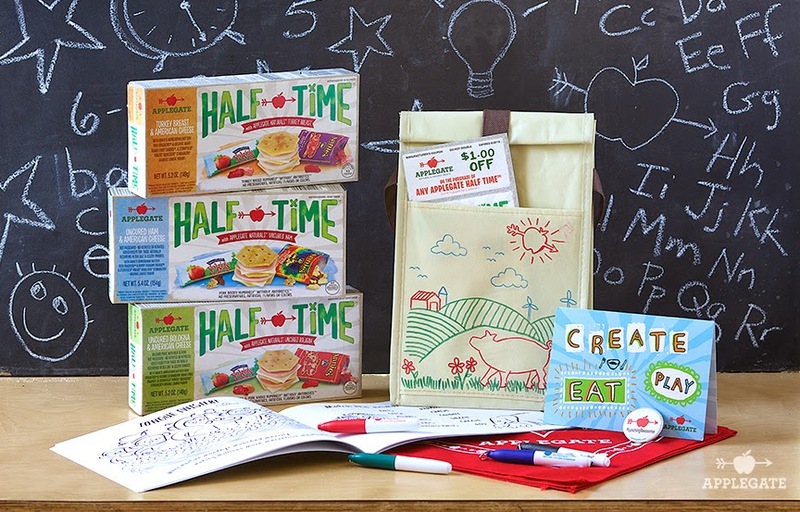 This is why I am so excited that my favorite companies (Applegate, Annie's Homegrown and Stonyfield Organics) have teamed up to bring you HALF TIME - a lunch you can feel good about! All three varieties include Applegate Naturals meats, Annie's Homegrown Buttery Rich crackers, Stonyfield YoKids Squeezers Strawberry and either Annie's Homegrown fruit snacks or graham crackers. I have to admit that I was not sure if this would be enough food to feed my 12 year old son for lunch. BUT, I was pleasantly surprised when he finished and told me that he loved it AND that it was enough for lunch! He loved making cracker stackers and with the yogurt and cookies he felt full but not weighed down. SUCCESS! it does not include a drink (this was NOT an issue for me since my kids carry a water bottle to school every day) but it might make a difference to you. the current price is about $5 at our local Target, so a little on the pricey side. I still think it is worth the extra money to have a healthy lunch in the fridge for a busy morning or a better to-go food for car trips, after school activities, field trips, museum outings or ball park visits. 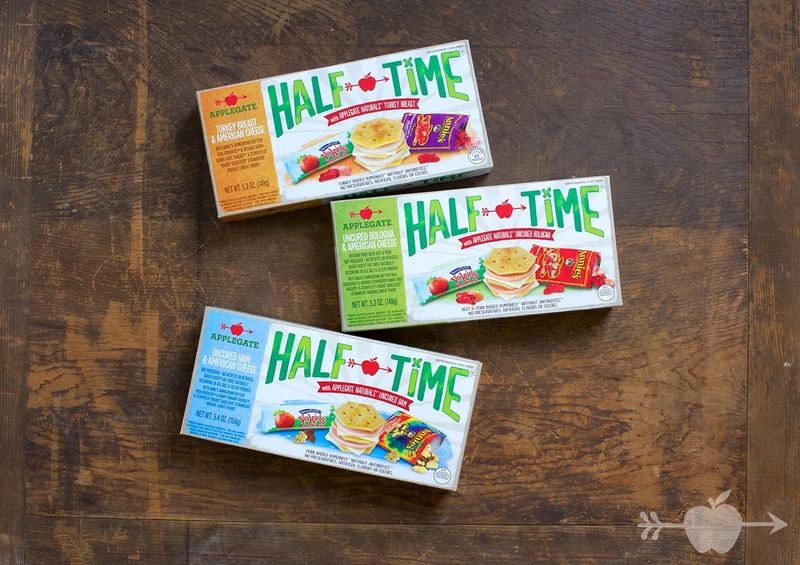 Would you like to try HALF TIME? Win an awesome prize pack! Open to US addresses only. Winner will be notified via email and has 24 h to claim their prize before a new winner is drawn. Good luck! 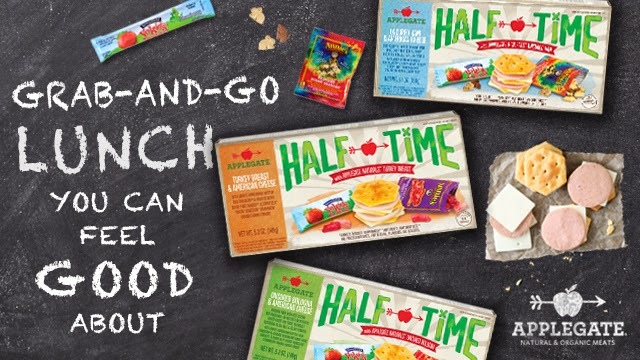 Disclaimer: Applegate provided me with a free HALF TIME snack kit. All opinions are my own. 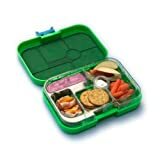 Here is our round up of Yumbox lunches for this week. 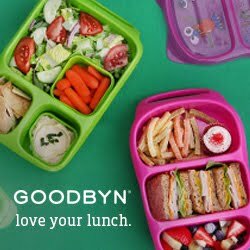 My daughter chose one of our German lunchboxes twice this week so I only have three lunch ideas for you but there will be more again next week since the Yumbox seems to just consistently work best for her. Somehow week 3 of the beginning of school is the hardest so far. Trying to keep up with everyone's schedule is harder then I thought now that I have 4 kids in 3 different schools (of course all with different school hours). I am still packing lunches every day (unless there is Macaroni and Cheese on the school menu and all four kids are batting their eye lashes to convince me to let them buy). How are you doing with week 3? Leave me a comment at the end of the post. I'd love to know your tips and tricks to stay organized and on top of things or hear what did not go so well this week! Happy National Guacamole Day! I have partnered with Wholly Guacamole® and Laptop Lunches to celebrate this fun holiday (we all need a reason to celebrate with guacamole, am I right? Psst, find the giveaway from last week or at the end of this post and win some yummy guacamole and Laptop Lunches Bento Buddies!)! Wholly Guacamole® wants to celebrate National Guacamole Day this year by paying it forward and they need your help! Use the hashtag #GuacitForward on Facebook, Twitter and Instagram to share how you are paying it forward! Together we can put a lot of smiles on people's faces! So, how did we celebrate National Guacamole Day? I also added a matching Lunchbox Love Card to encourage my kids to #GuacitForward today! This lunch is also posted over at The Little Crooked Cottage as a Literary Lunch. Head over to the fabulous blog of four children's book authors and check out the wonderful Literary Interviews with Mr. Pig himself! And if you want to find out more about Louise or are curious about what might be in her pockets right now, head over to her special interview! Louise Love Art - written and illustrated by Kelly Light - is a beautifully illustrated book about the importance of creativity in all forms. In Louise's own words: "I love art! It's my imagination on the outside." But working on a masterpiece is hard sometimes when your little brother is working on his own masterpiece at the same time. This sweet and imaginative story is a great book for all budding artist out there! My kids really enjoyed this book and could relate to the sister-brother relationship in this book (with four kids there is always a lot happening at once). As you can see our copy is well loved already and I know this book will be read many more times to come. Hope everyone's week is filled with creativity. Happy Reading! National Guacamole Day is this coming up this Tuesday and Wholly Guacamole® is celebrating by giving back to the community and encouraging others to do the same! With their #GuacitForward campaign Wholly Guacamole® wants to encourage everyone to pay it forward! They are also spotlighting their partners who contribute to charity and pay it forward. 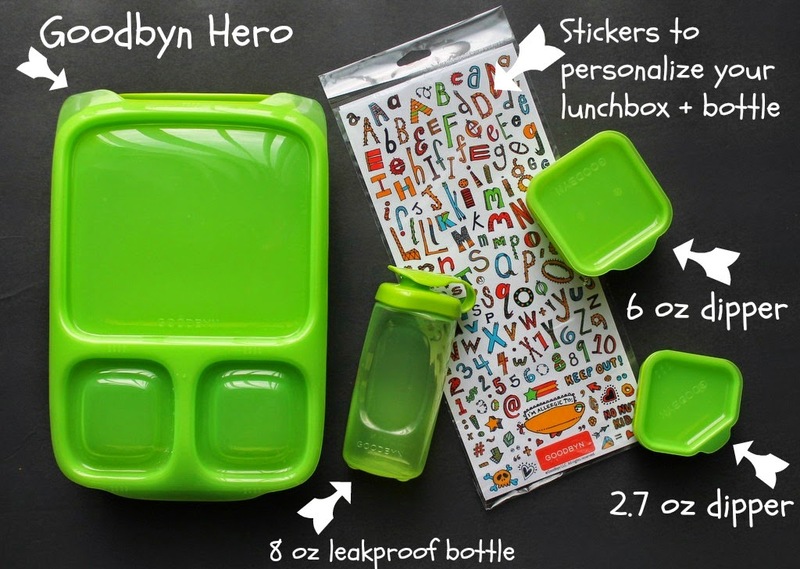 Wholly Guacamole® and Laptop Lunches have teamed up for an amazing Giveaway and you can win some fun and yummy lunch stuff while giving back! Doesn't this Shrimp pasta salad look delicious? 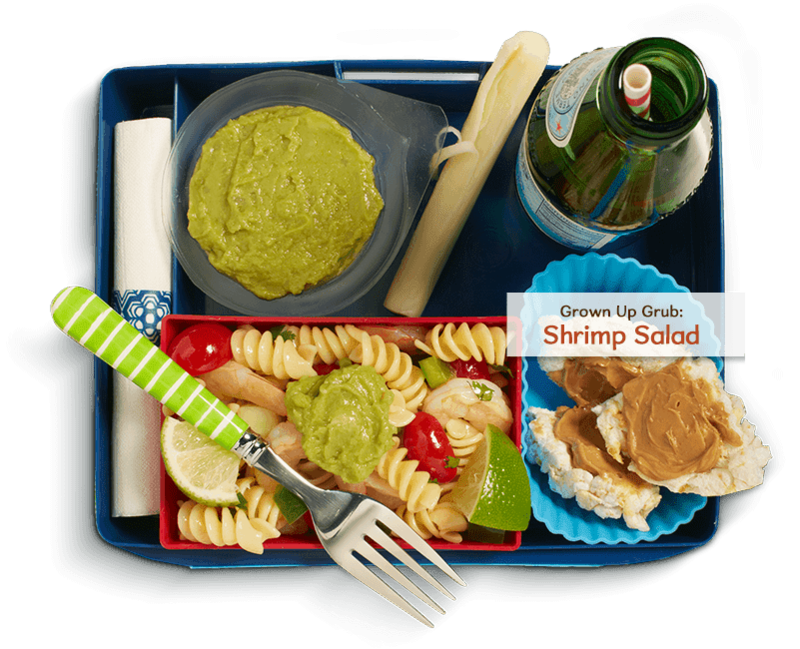 For fun lunch ideas using Wholly Guacamole® head over to their website. When you get there, select Lunch ideas and you can scroll through all the Grown-Up and Kid's lunch ideas. If you click on the recipe name, a convenient shopping list pops up to make it easier to pack your own yummy Wholly Guacamole® lunch! 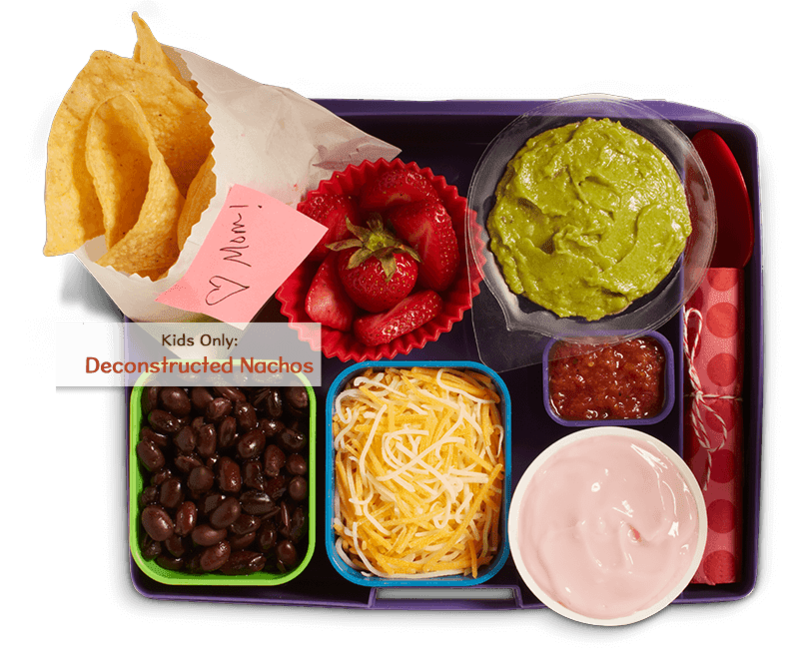 I let my kids look at all the fun lunch ideas and this deconstructed Nacho lunch was their favorite. I am glad there is an easy printable list on Wholly Guacamole®'s website and I am always looking for new lunch packing ideas. Would your kids love this? For more ideas on how to pack a great National Guacamole Lunch go to Wholly Guacamole®. So what can you win? Enter my easy giveaway below! Good Luck! (Shipping address has to be in contiguous United States). Winner will be notified via email and has 24 h to claim their prize before I will draw a new winner! This lunch is also posted over at The Little Crooked Cottage as a Literary Lunch. Head over to the fabulous blog of four children's book authors and check out the wonderful Literary Interviews with Mr. Pig himself! Plus, if you want to know why the interview with Joe and Sparky turned out to be a little awkward, head over to Mr. Pig's interview! Do your kids have the back to school jitters? You can help make them feel better about school by reading "Joe and Sparky Go to School" by Jamie Michalak and illustrated by Frank Remkiewicz to them. You can be sure that the giggles won't stop! 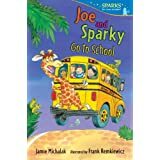 My kids loved to imagine what would happen if Joe and Sparky came to their school and they all have their own favorite parts in the book! This book is so funny and sweet and the two mismatched friends can make everyone relate! Sparky, the turtle, is cautious and careful and his fun-seeking friend Joe, the giraffe, loves to discover new things. When Sparky gets stuck on the roof of a visiting school bus the friends learn quickly that there is a lot to learn about school. Who knew the math peas were not a snack? My kids especially love the part in the book when all the kids (and Joe and Sparky) get send for a bathroom break and Joe and Sparky discover the "magic pond." We love this book (as you can see from last year's post) and I highly recommend the entire Joe and Sparky series! They are a great read for all ages but best read aloud for the best giggle fun! My daughter started Kindergarten this week. I spent some time with her over the weekend talking about the foods she wanted to have in her lunchbox. She picked kiwi, cheddar bunnies, cucumbers and mini sandwiches. I tried to keep her lunch looking familiar and filled with the foods she picked while switching it up a little for variety. The first week of school is exciting enough so I wanted to make sure lunch was predictable but yet fun. So, these yumboxes all look somewhat alike but not quite. How do you make your kids feel comfortable the first week of school? The theme of our Monday yumbox is "Hello Kitty on a Farm" - packing lunch with a 5 YO is so fun! I am so excited to share the new Goodbyn Hero with you! 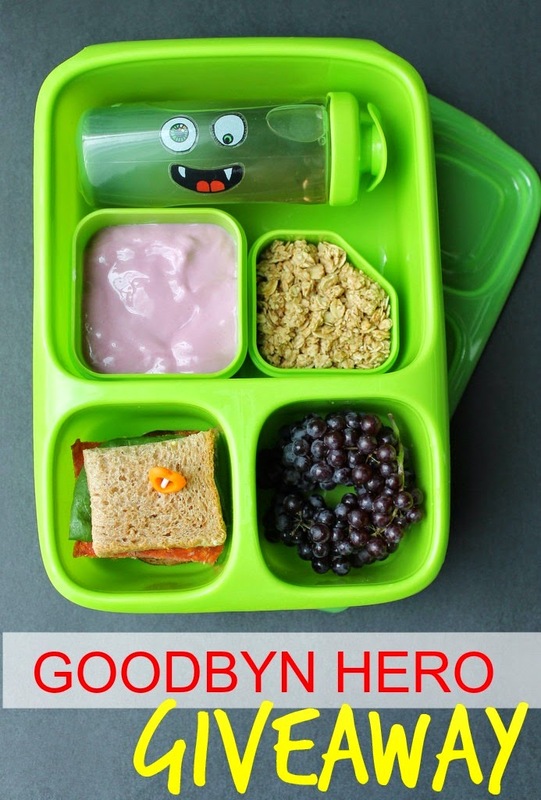 We love our Goodbyn lunch boxes (they were the very first we started packing lunches in) and could not pass up the opportunity to try out the new Goodbyn Hero and give you a chance to win your very own! 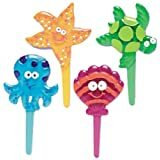 My kids love spoons and sporks and this was perfect for them. The spoon is deep enough to be great for soups but also yogurts, applesauce or other spoon worthy foods! We love the new Goodbyn Hero just as much as the Goodbyn Original and the Goodbyn Bynto. Since I have 4 kids different ages I love that I can make the lunchbox fit for everyone! If I add the dippers and bottle to the lunchbox my Kindergartner can take it and have enough food and a drink packed conveniently all in one box. 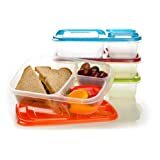 If I pack for middle school I can pack the lunch box to the top and add the dippers separately to the lunch bag to give my son the extra fuel he needs. And for the other two kids I can personalize it as well by adding the dippers and bottle or sending them separately. A real grow-with-you lunch box! The only thing to be aware of is that the lunchbox is large. It will not fit into a regular lunch cooler. It fits best into the Goodbyn Insulated Lunch bag! We have the insulated lunch bag that fits both the Bynto and the Hero so I had no issue with the size but wanted to mention it. Want to win one for your child? Enter here! Good Luck! US Residents only. Winner will be notified via email and has 48h to claim their prize. Disclaimer: Goodbyn sent me a Goodbyn Hero prize pack to review. All opinions are my own.